Another Long Walk: Day 59: Giant Incense Burners, Paramedics, and Webcam Adventures! Day 59: Giant Incense Burners, Paramedics, and Webcam Adventures! October 9: Santiago! The promised land! Without a doubt, I intended to take a zero day and explore this bustling town. 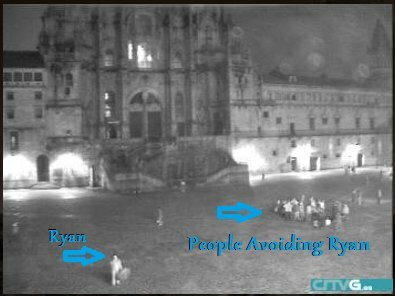 You read my webcam misadventures at the wine fountain, but you didn’t read about another aborted webcam cameo in Burgos. The webcam Wassa found was indeed pointed at the cathedral I would be walking past, but it was probably a half mile away and if I was visible at all, I’d have been the size of a mere pixel. Before leaving my hotel room in the morning, I checked my email and he was online, so I told him that I’d be leaving the hotel and probably be in front of the cathedral in as little as 15 minutes. I told him I’d be carrying an umbrella—it was raining outside, after all, and I headed out. I told Vivian we had to stand around in front of the cathedral for at least a few minutes so Wassa would have a chance to spot us. We saw a camera on one of the buildings, and I pointed to it saying that I thought that was the webcam. The angle was right. We waved to the camera, and Vivian wanted to see us on it herself so she pulled out her smart phone, loaded up the website with the webcam, and there we were! It wasn’t a very good image of us, though. We were tiny little dots, and had we not known where we were standing, we’d have had a tough time picking ourselves out of the image. With her smart phone, though, we could also see that we were close to the edge of the photo, near the back, and we moved into a more prominent location to make it easier for Wassa to find us. We were out there, on display in front of the webcam for probably 15 minutes or so, and later, when I got back to the hotel and got online, checked if he had seen me. He probably did, but said he couldn’t tell which of the dots were me because everyone had umbrellas. There wasn’t enough detail to pick me up. Drats. Foiled again…. Vivian and I went out for breakfast catching up on each others adventures, then she directed me to a fairly large bookstore where I went in search of a guidebook for Finisterre and Muxia, but we came up empty. It wasn’t that critical since I had maps for most of the distance, but it would have been nice. Eventually, we headed back to the cathedral for mass. 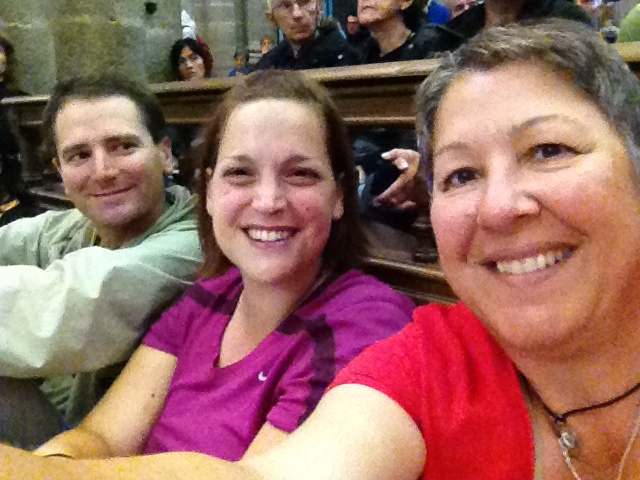 I hadn’t been to mass since… well, the very first day I started my hike in Le Puy. =) Somehow, it seemed appropriate to bookend each end of my pilgrimage with a mass. This mass had a few differences from the one I was at in Le Puy. For instance, this time, they all spoke Spanish rather than French. Which meant I could actually pick out some of the words they said, although they still spoke too fast for me to understand the entire sentences. Then, I was a little surprised to see Charles, the priest from New Zealand, up there dressed in priestly robes. It looked like they took several pilgrims from various countries to speak a few words, and Charles came up and said his few words—in English since he couldn’t even pronounce the word ‘alburgue’ correctly in Spanish if you threatened him with his life. =) There were half a dozen of these pilgrim talkers, but Charles was the only one I actually knew. I assumed the others must have been priests in their respective countries as well, and they clearly spoke all sorts of languages that I couldn’t recognize. Undoubtedly, some of them were French, German, Korean, and who knows what all else. I rather liked the international spectacle. And then, there was one other little difference: the incense burner. This was no ordinary incense burner. It’s called the Botafumeiro, a famous thurible (yeah, I didn’t know the word either) is enormous, weighing in at 80 kilograms (about 176 pounds), and burns an enormous hunk of incense as its swung dramatically through the cathedral on a pulley system. Truth be told, probably 95% of the people who go to this mass are here specifically to see the incense burner swinging through the structure. They lowered the Botafumeiro, started the incense burning, then a priest swung it by hand as far as he could to get the thing started at which point six guys in robes pulled at the rope attached to it to swing it higher and higher and higher! Cameras flashed everywhere, an endless parade of flashing lights that gave the whole event even more appeal. From our perch in front of the front pew, the incense burner seemed to pass almost immediately over us. We could practically reach out and touch it—if we wanted our hand ripped off as it swung by. Then it slowed down to a stop and mass was over. I wanted to stop and see crypt at allegedly held Saint James’s mortal remains, but I decided to come back later and see it. Now that everyone was leaving the mass, the line for it was absolutely enormous. I'd come back later when things were less crowded! Vivian was the first to peal off. Hilary and I wandered around a bit before we eventually parted ways as well. An hour after mass had ended, I headed back to the cathedral to check out the lines. There were actually two lines. One that went down to the crypt with Saint James’s remains, but the other went up to a large statue of the apostle, which I thought looked kind of like a large Buddha, which people can hug or whatever. I walked around to check out the lines where I saw Nancy and MaryK. Nancy seemed positively freaked out, though, and told me that Jeannie was in there helping someone who had hurt themselves. Huh? I was completely oblivious to anything unusual going on. Eventually, some cathedral personnel happened along and closed off the doors leading into and out of the Buddha exhibit, and we were told that help was on its way. In the meantime, we waited around the exit for Jeannie to come out. About ten minutes later, she popped her head out asking if paramedics were on their way—this woman needs help ASAP. We told her that that’s what we were told, help was on its way. We had no idea why it was taking so long, though. We were in the middle of a major city in Spain. It seemed like help should have been practically right around the corner. Jeannie went back to the hurt woman and we continued waiting outside just chatting. I tried to cheer Nancy up and assured her that sending Jeannie in was the right thing to do and that she’d be fine. And I tried to distract her from the emergency by talking about other stuff. Another ten minutes go by, and even I’m starting to grow a little concerned about the lack of paramedics arriving. What the hell is taking them so long? It’s not like we were out in the boonies in some sort of obscure, hard-to-find location. We were at probably the most well-known building in the entire city, the middle of a big city! Finally, though, paramedics arrived. I still have no idea what took them so long, but Jeannie finally left the woman and rejoined the rest of us where we got more details. I walked around with them a bit, and they needed to go down to the train station to buy their tickets back to Madrid. Looking at a map, I could see that the route to the train station went right past my hotel and I volunteered to lead the way. I didn’t really have anything else to do now that mass was over. They planned to get tickets for the afternoon a couple of days later, but were told that that trail was full. The 10:30 PM train tomorrow night, however, still had space, and that’s what they booked for themselves. Then I walked back towards the cathedral with them again. First, I got an email from Vivian saying that she had bumped into Karolina in town and was currently in front of the cathedral if I wanted to catch up with her. Unfortunately, the email was sent an hour earlier so presumably, Karolina wouldn’t have been there anymore. But at least I knew she was in town and I should keep my eyes open. At the very least, I could probably find her at mass the next day. And secondly, Wassa did see a lot of people in the webcam, but he couldn’t identify me specifically because everyone was carrying umbrellas. I reported the findings to the girls. I replied to Wassa saying that that was disappointing or something, and he replied almost immediately since he was still online. Not surprisingly, really, since it was probably close to noon Pacific time where he lived. Maybe we could give it another shot? I told him it wasn’t raining anymore—not at the moment, at least—so nobody had their umbrellas open. I’d go back to the cathedral and twirl around my open umbrella. Look for the figure with an open umbrella. I’ll be the only one this time! I told him to give me a half hour or so. I wasn’t that far away, but I was still at dinner and needed to finish up before walking down there. The cathedral still had quite a few people milling around, but none of them had any open umbrellas. Perfect! I opened up mine, and started twirling it around in the air to get the attention of the webcam. =) I did this for about ten minutes when I spotted two of the Australian girls I had been camping with earlier—Kathy and Emily—so we chatted for a few minutes. “Did you finish 50 Shades of Grey?” I asked, curious. One of the character names in the book is “Grey,” and I joked that the sequel—called 50 Shades Darker, must be about a different man Anna sleeps around with named Darker. They continued on, and eventually Nancy, MaryK, and Jeannie arrived they all waved to the webcam. They came to see the cathedral lit up at night, but it wasn’t really lit up at all and they were a bit disappointed about that. At that point, I had spent about an hour swinging around my umbrella, and I figured that was good enough. If Wassa hadn’t spotted me then, he never would. I walked back to my hotel for the night and waved goodbye to the girls, already thinking about seeing them off from the train station the next day. I hadn’t decided if I’d take another day (or not) in Santiago, but if I did, I knew when their train was departing. I rather liked the idea of going down there to surprise them and wish them good luck. =) But that would only happen if I stayed in town for an extra day…. why this one is so grainy compared to the others. blocked off so people can’t touch it anymore, though. I stand triumphant in front of the cathedral. From left to right, Jeannie, MaryK, and Nancy. Galicia, apparently, is famous for their octopus. Yum! served on scallop shells. How appropriate! Swinging the incense burner higher and higher and higher! Here the incense burner goes so high, it seemed like it was about to hit the ceiling! Here's a video from YouTube with some nice shots of the Santiago Cathedral which is pretty cool. I did NOT make this video, however. =) The only thing I really feel is missing from it is that they never actually show the swinging incense burner. An oversight, I'm sure. I love hearing the whole "backstory" of our webcam adventure! That was fun!